Were you ever talking to a friend about how copyright restrictions really affect us all, and wished you could just hand them one little booklet that explains everything? In full-color comics? With QuestionCopyright.org Artist-in-Residence Nina Paley’s increasingly ubiquitous Mimi & Eunice characters? Yeah, that happens to us all the time too. Fortunately, now there is such a booklet. Don’t buy just one — that would be economically foolish. Buy them in bulk and hand them out at parties, or at work (that would be economically smart, especially if you work at the RIAA). If you order 20 they’re only $0.60 each, and our super-seeder-bulk pack of 100 is just $50, a mere 50 cents each Boxes of 500 for just $0.18 per comic! Originally funded by a Kickstarter campaign, these booklets are “Free-as-in-freedom” — you can copy, translate, and edit them, and even print out your own if you really want to spread the word (though purchasing them from us at eminently reasonable prices is a fine option too, of course). Finally, a comic strip about spirituality, recovery, psychology, AND Intellectual Pooperty. This first official dead tree edition collects over 200 Mimi & Eunice cartoons from mimiandeunice.com. 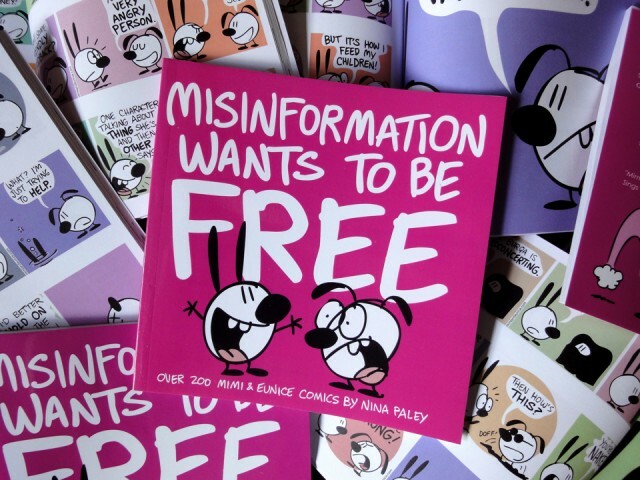 Printed in full color throughout, Misinformation Wants to be Free is sure to delight addicts, lawyers, a small minority of libertarians, and people who hate trees. Each copy is lovingly hand-signed by Nina Paley, with a little hastily-scrawled drawing of either Mimi or Eunice. Here’s the video trailer for the book. Please share!